The new Key-Link aluminum handrail is ADA-compliant and can run along a guardrail or on its own. Railings, other accessories can help deck projects stand out. The average decking and other outdoor living projects are getting larger and more extensive, so it’s no surprise that the demand for railings, lighting and other accessories is growing as well. Homeowners want the wow factor that an impressive railing system or extra trim options can bring to a project. At the same time, contractors are looking for solutions that will make sure a deck lasts as long as the new alternative decking and railing options on the market. With that in mind, Fortress Building Products has introduced its Evolution Steel Framing. Evolution Steel Framing from Fortress is designed to address the need for a substructure that has the same life as the composite and PVC decking options on the market. 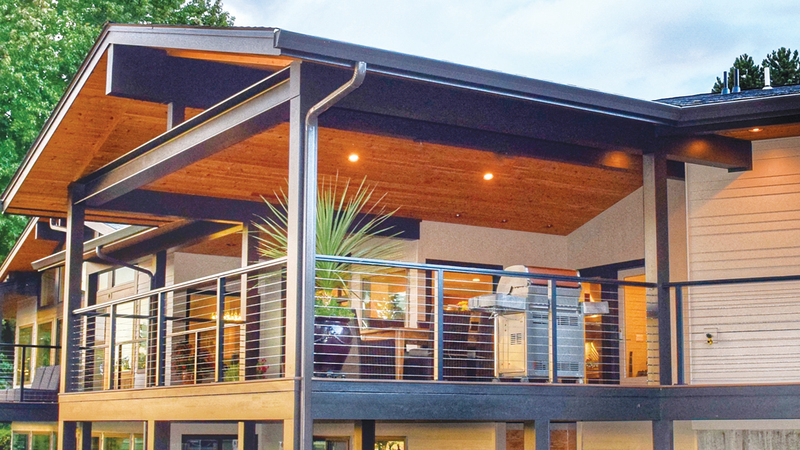 “Most alternative decking and railing materials have 25- year to lifetime warranties while a typical wood frame has a life of about 12 years,” says Marketing Programs Supervisor Alyx Armstrong. “The steel framing will stay perfectly straight without warping, crowning, twisting or rotting. 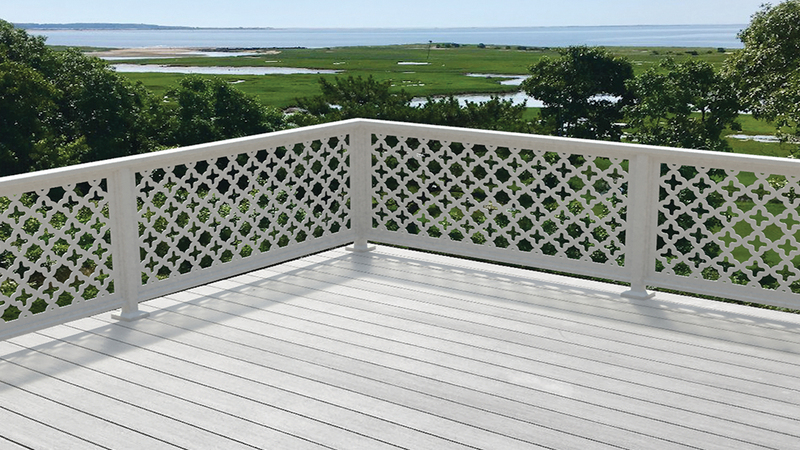 Additionally, the Evolution Steel Framing system allows you to span farther than wood, resulting in less post and footers that block the views of the deck.” Steel framing is the natural evolution of the demand for low maintenance products that started with alternative decking and railing products, Armstrong says. The demand for improved aesthetics has resulted in a number of new products this year and last, as manufacturers look to offer new railings and other options. Feeney is rolling out three new panelized infill systems for its Design Rail aluminum railing systems in the second quarter of 2019. The infill panel options will include laser-cut aluminum panels, available in a variety of designs, including custom patterns. Other options will include stainless steel mesh panels and resin panels with organic materials, such as leaves and branches, embedded in the material. The steel and aluminum panels are for exterior and interior use, while the resin panels are for interior projects only. As part of Feeney’s new panelized infill systems, the laser-cut, powder coated aluminum panels are available in a variety of designs or with custom patterns. The mesh option has been an especially common request. In the past, says Feeney Chief Product Officer Andrew Toimil, contractors would have to work with a custom metal fabricator to get a product like that. Now, there is a stock option that makes it easier and less ex- pensive to deliver that solution. Feeney sells its railings in both 36″ and 42″ heights, so the panels will be stocked in those heights. Dealers can capture business that would have previously gone to a metal fabricator by using AGS Stainless’s design services and just-in-time manufacturing. AGS Stainless is also working to make railing options simpler for con- tractors and dealers by making it easy to deliver a high-end, custom look without tying up money in inventory. Instead of having to send that work elsewhere, dealers can capture that business because AGS Stainless will do all the fabrication on behalf of the lumberyard. That simplicity of installation has become only more important with many contractors struggling to find and keep their best employees. Atlantis Rail’s new Spectrum System features pre-drilled square posts and fittings, available in standard colors of black or metallic silver or special colors of pure white, pebble grey, light brown and dark brown. Atlantis Rail Systems has developed the Spectrum System, a new stainless- steel square post cable railing system featuring pre-drilled square posts and fittings to surface or fascia mount posts and mount customer supplied flat handrails. Cable infill offers a choice of 1/8″ or 5/32″ cable with HandiSwage Studs. The powder-coated, stainless steel posts are available in standard colors of black or metallic silver and special colors of pure white, pebble grey, light brown and dark brown. 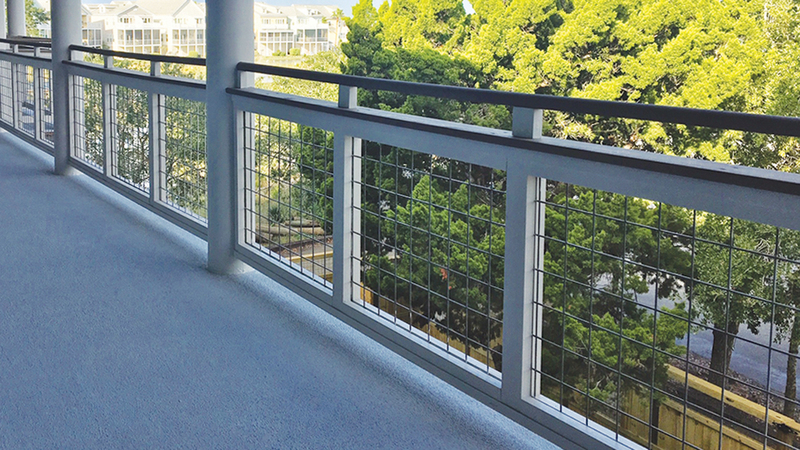 Atlantis Rail also introduced the NOVA II System, an off-the-shelf aluminum post and rail cable railing system that features powder-coated aluminum posts, handrails and foot rails with horizontal cable railing infill. The posts and rails are offered in black, white and bronze. The NOVA II System was developed as a more cost-efficient cable railing option than its stainless-steel cable railing systems, while also providing a simplified approach to a complete cable railing system as the NOVA II post and rails come in kits with everything needed for installation. 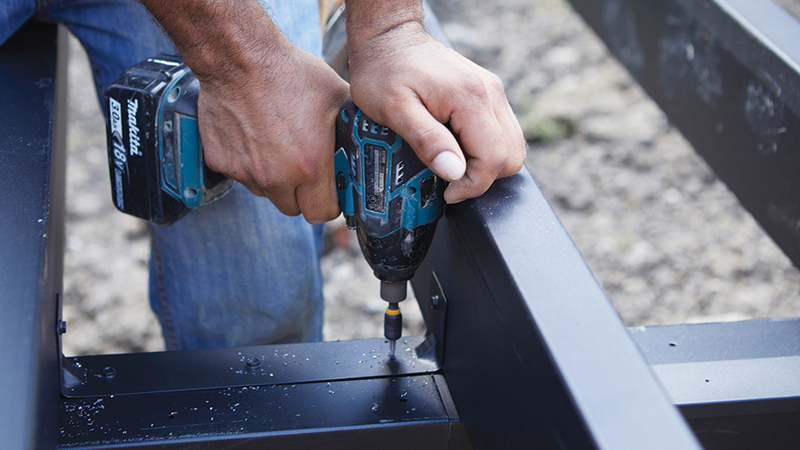 Post mounting hardware, cable and cable mounting hardware are sold separately. Customers are gravitating toward low-profile, high-quality materials, Hicks says. 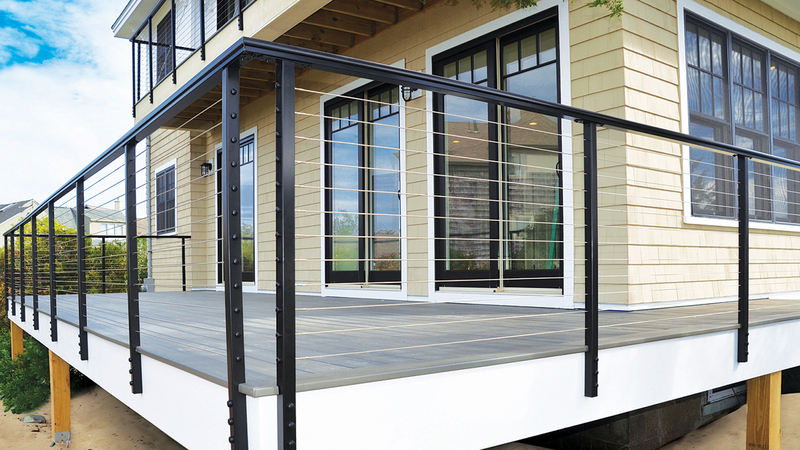 Key-Link recently introduced a new ADA-compliant aluminum handrail to run either alongside a guardrail, or on its own, as well as a new under-deck bracket, which is a simple, code-approved way to install post mounts to wooden decks. Both of those products address the needs of customers to have simple, well-designed products, Hess says. “We look at the little things that can save time and we build those features into our product,” she says. The key trend Wild Hog Railing is seeing in the market right now is that homeowners want products that are simple and don’t obstruct their vision. 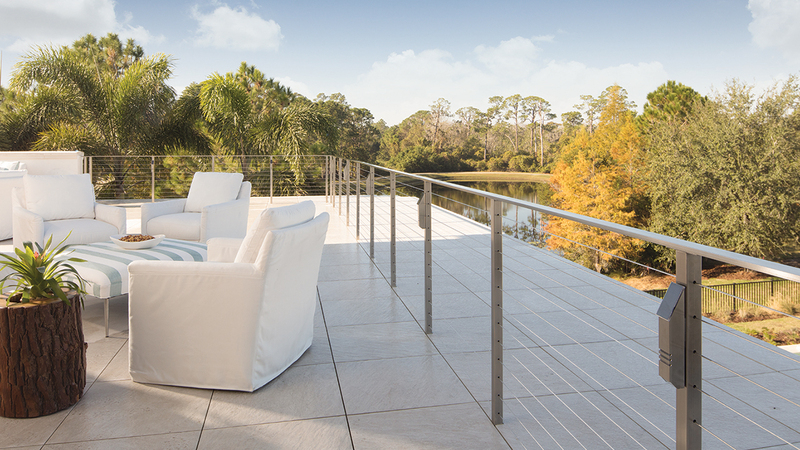 People want to enjoy the view, not their railing, says Product Specialist Craig Smalley. Wild Hog’s aluminum Hog Track is available in 6′ or 8′ lengths and black or white finishes, allowing for a finished look to a rail, fence, arbors or other projects. The company has added Hog Track to its offerings, allowing for a finished look to a rail, fence, arbors or other projects. The aluminum Hog Track is available in 6′ or 8′ lengths and black or white finishes. RailFX with Ultra-tec cable combines the durability of aluminum with innovative design details that the company says provides, structural integrity and ease of installation. Nationwide Enterprises, the parent company of The Cable Connection, recently acquired RailFX, LLC. That means dealers will now be able to source RailFX and Ultra-tec products from one company. 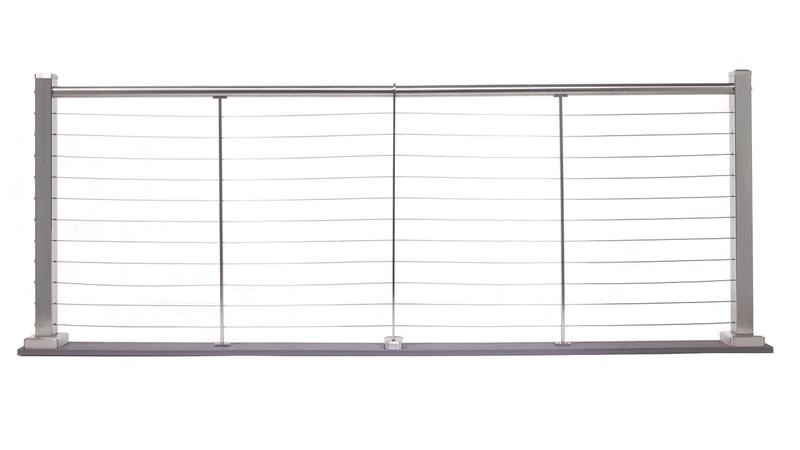 All of the rails and posts are made from high-strength 600-aluminum extrusions and can be cut to length onsite and assembled using pre-engineered components that easily snap and screw together. Dealers don’t have to keep the product in inventory because it is avail- able on a 48-hour quote turnaround, with a drop ship program to the lumber dealer. The company also provides flexibility in colors, realizing there is not just one particular trend for all markets. The Versatex Canvas series is available in five colors (walnut is pictured), in both a WP4 profile and a stealth beadboard. 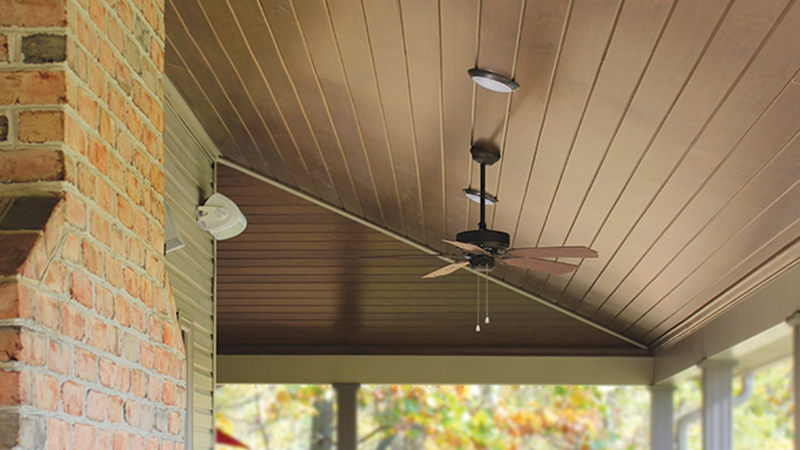 With homeowners opting for more low-maintenance options on their decks, Versatex is also seeing more demand for PVC trim products. The Canvas series of PVC cellular trim was originally launched in a WP4 profile in three colors (Macore, black cherry, and walnut) with amber added in 2018 and weathered grey in 2019. Versatex also introduced Canvas on its stealth tongue-and-groove bead-board this year in response to demand from its contractors, Kapres says. Versatex sees a lot of opportunity with deck builders to expand the use of Canvas. 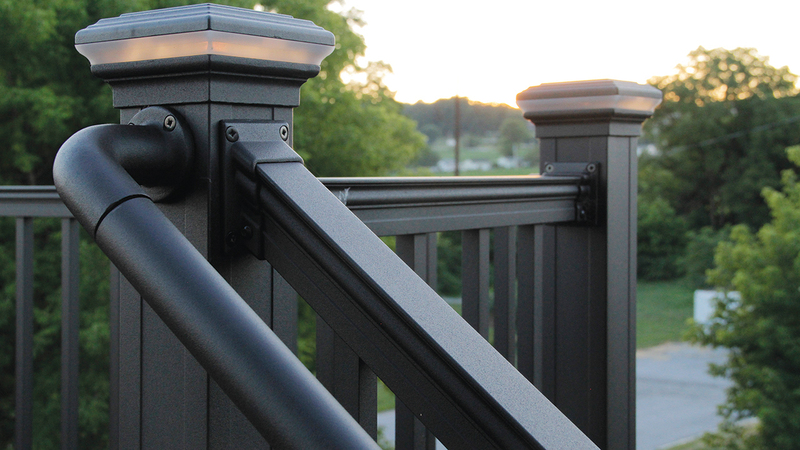 Featuring stainless steel posts and cable, the new Deckorators SLX cable is designed for outdoor views. The 2-3/8″ posts are available in 36″ and 42″ heights. Predrilled intermediate InvisiPosts come in 36″ and 42″ heights, while 1/8″ cable is available in lengths up to 50 feet.